My latest comic is all about an unhealthy obsession. One of the most dangerous aspects of being an artist is getting obsessed for things that other people couldn’t care less about. The scary (and maybe even familiar) thing about his story was that his project was all about the process of making art. The felt tipped pens would not be the art object, but only a tool with which he thought he would be able to make good art. I can lose myself in these things as well. Looking for the perfect way to use a ruler for several days. Or spend weeks finding the best way to hold my pencil. Running the risk of not finishing anything. ‘Obsession’ delves into this dangerous mindset. In the first panel, we see Michael, a young artist. On his wall there are hints of his profession, drawing. Drawing flowers, most likely. Michael complains about his drawing ink fading to fast. Panel two gives us the same camera angle of his studio, but now we apparently made a time jump. Michael is explaining to a young woman, Britt, how he means to create his own ink. Ink that can never fade. In panel three, we the camera angle is the same again. We’ve made another time jump, Michael and Britt are together now. She looks dressed up to go out. Michael forgot the time (and forgot to shave). The light box on the table has disappeared to make room for mixing ink. Panel four, we’re still in the studio. Compared to the first panel there are a lot less flower drawings on the wall. And way more ink bottles. Britt is dragging Michael of to what promises to be an interesting movie night. Both of them look older. Michael looks pale and unshaven. The studio in panel five changed even further. Now there’s ink everywhere. The garbage hasn’t been taken out for weeks (months?) and there are crazy formula’s on the whiteboard. The drawing table lost its function and now only holds more ink. Britt calls from the kitchen, some guests have arrived. Michael doesn’t care. In panel six, we see Britt leaving. She looks older here, as does Michael. They must’ve been together for more than twenty years. In the end her love for him wasn’t strong enough to compete with this crazy ink obsession of his. Michael hardly seems to take notice. In panel seven we see Michael reach his goal. His ink is everlasting now. Only now does he call out for Britt, who must’ve left months (maybe years) ago. His heart can’t take the excitement and is stops instantly. Michael falls on the floor, taking most of his precious ink with him. The eighth and final panel shows us the studio after god knows what time. It looks brown and dirty compared to the first time we saw it. Michaels body undoubtedly rotting on the floor, just out of our sight. The ink splattered on the whiteboard. It is, after all, everlasting. 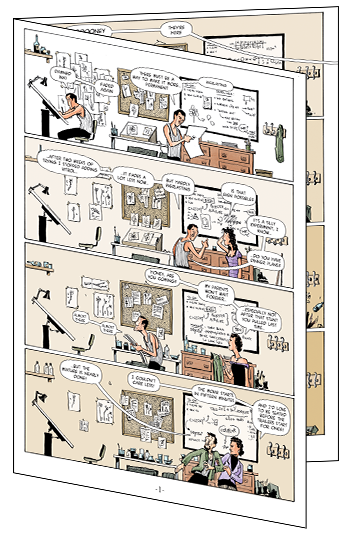 Besides our two main characters Michael and Britt, the third character in this comic is The Studio. The main comicsperiment with this was to see how much of a story a background can tell. So the entire story is set in the same location, from the same point of view. That way the background becomes an important part of the story for the reader to get information from. I thought it would be a nice touch to make Michael an illustrator of dried flowers. The exact same process – from vibrant life to barren death – he tries to counter with his search for everlasting ink. 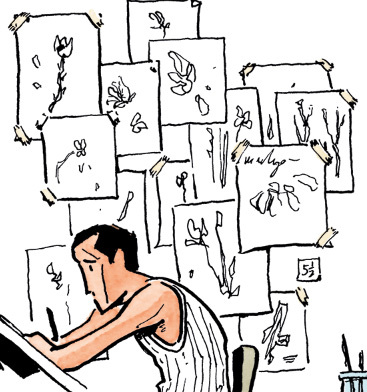 So if you look closely in the first panel, you can see lots of flower drawing hanging on the wall. 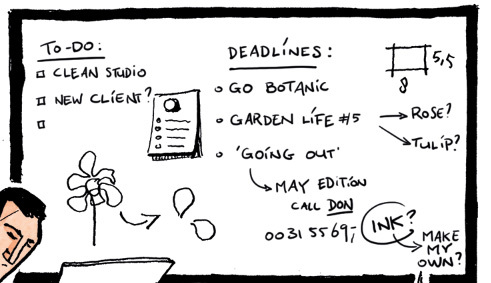 On his whiteboard are to-do items related to (fictional) gardening magazines, he probably is working for. As the story progresses we see ink bottles and samples overtake the flower drawings. His experiments become more important that the actual work he actually does with the ink. Even the drawing table eventually turns into a lab-table. Character design for a two page comic is always a bit tough. In the end you want to communicate as much as you can in the limited amount of space you’ve got. Most of the time the main rule of thumb is “if it doesn’t distract, you’ve won half the battle”. But in ‘Obsession’ I thought it would be important to see the character age and slowly derail. 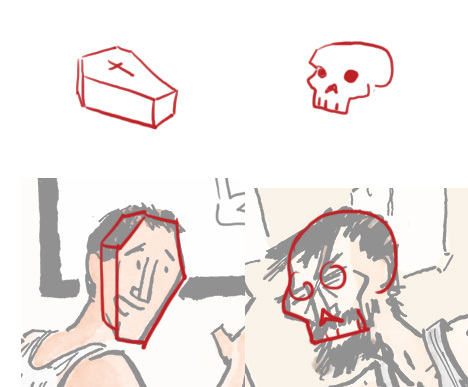 Because the main themes of the comic are death and the fact that eventually nothing lasts forever, I thought it would be fitting to base Michael’s head shape on two symbols of death: a coffin and a skull. This is one of those visual twist you don’t expect the reader to consciously notice. But I do think that adding a little hint to universal imagery like this enriches the story. So once I drew the first background (which became the template) I thought about making a cheat sheet with all measurements. But then I thought it would be easier(and more fun) to actually note the measurements within the panel. Among all of the above, this was also an experiment in density, I would say. How much information can you put into a two page story. I think it forces the eye to linger a bit longer than usual on what’s going on the page. Did you think it worked?